Though we thoroughly enjoy safari/wildlife viewing in Namibia, Rwanda (Gorillas), South Africa, Zambia, and Zimbabwe, it’s no secret that our favorite safari area is the wildlife-rich Okavango Delta in Botswana. We feel this is the most compelling wildlife-viewing environment in all of Africa. The safari experience encourages us to look outward from ourselves and realize the vast wildlife that exists on our planet and how little physical space humans occupy in comparison, relative to the exponential environmental and ecological impact we can have. In contrast to East Africa, we feel Botswana offers a more authentic, environmentally friendly safari experience. A bit analogous to Bhutan, Botswana, particularly the Okavango Delta, has opted for a low-impact/high-value model for tourism, versus a mass market system. The high-touch luxury safari camps (Chiefs, Vumbura, King’s, Abu, and Mombo) make for a truly unique and enlightening Africa wildlife adventure. A 2014-designated UNESCO World Heritage Site, the lush Okavango Delta is among the most important protected wildlife areas in Africa. We fully agree with Lonely Planet’s assertion that the Okavango wildlife experience is “like walking onto the set of a wildlife documentary”. The “Big Five” (lions, elephants, cape buffalo, leopards, and rhinos) can be found here, in addition to particularly outstanding birdwatching in the delta’s panhandle. This is a truly unique landscape, sculpted by the waters that rise and fall in time with the seasons. Coupled with its array of noteworthy small, luxury safari camps, we believe Botswana to be the premier safari destination in Africa. Notwithstanding Chief’s extensive renovation and re-opening in the summer of 2016, one thing that has not changed is Chief’s extraordinary location on the wildlife-rich Moremi Island. The wildlife-viewing here includes all of the “Big 5” (lions, elephants, cape buffalo, leopards, and rhino) hence, our choice as a prime family safari site. Chief’s renovation includes 10 luxury bush pavilions, all with private terrace plunge pools. In addition to the 10 pavilions, which are in effect like small cottages, a new feature that we particularly like is the 2,035 sq. foot Geoffrey Kent Suite that sleeps six. Our Lynch Family particularly enjoyed “pizza day” thanks to Chief’s new pizza oven! Other Amenities here include indoor and outdoor showers (using the outdoor showers in this remote, pristine environment is truly exhilarating! ), polished teakwood floors, insect-proof netted windows, colorful batik fabrics, a new spa treatment room, a small pool, and a picturesque dining area/observation deck. Based on Chief’s location overlooking a large lagoon on the northwest tip of the island, many mokoro (canoe/boat) wildlife excursions are available in the day during the dry season of the summer months. Laundry service and Wi-Fi are available daily in all rooms, though spotty due to the remote location. Emergency medical evacuation is available in case of an emergency. The Vumbura area compromises two separate satellite camps (Vumbura Plains and Little Vumbura, with Vumbura Plains being our preference). Each of Vumbura’s spacious “rooms” is raised off the ground, with indoor and outdoor showers and en-suite bathrooms. Other features include a private, small plunge pool and “sala” (a place to watch the passing of wildlife of the Okavango). Don’t be surprised to see elephants walking behind the tents and feeding on the trees. 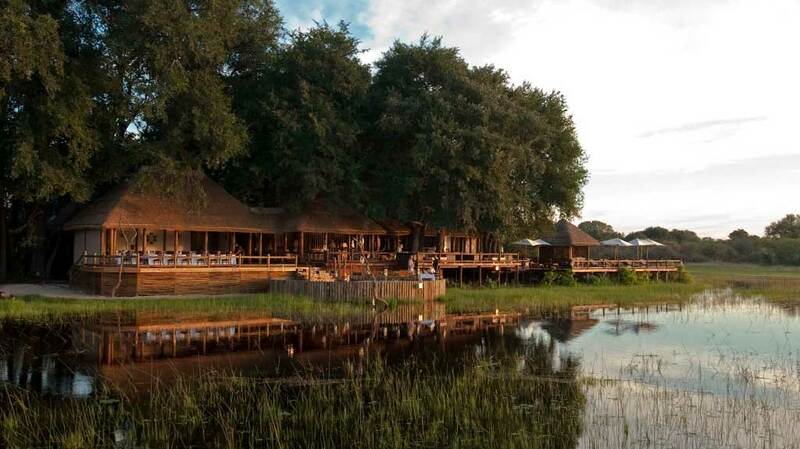 Each camp has its own raised lounge, dining bar, and area with truly amazing views of the Okavango Delta. This nicely designed common area is where you will mix with fellow guests and exchange your fun wildlife drive tales! We particularly enjoy the comfortable cushions and seating of the camp deck; a perfect setting for star-gazing or the nightly campfires. Wildlife here is plentiful, including impala, hippos, zebras, wildebeest, and crocodiles (+ amazing bird watching!). Similar to other safari lodges, Vumbura includes morning, afternoon, and night wildlife drives, using 4×4 Land Rovers. If truly adventuresome, you may also request a nature walk (accompanied by an armed guide). Being a “wet camp” gives you ample opportunity to explore the delta via the fun mokoro (dug-out canoes). Based on its location on the extreme northern area of the Okavango, Vumbura may offer the widest range of habitats and species, with a chance of observing just about every animal occupying the Okavango Delta. Currently undergoing a complete rebuild scheduled to reopen in June 2019, King’s Pool overlooks the handsome oxbow lagoon, from where it gets its name, in the Linyanti Wildlife Reserve, bordering Chobe National Park. Once a rustic campsite for Scandinavian royalty, the newly designed King’s Pool will be focused on providing an immersive safari experience while maintaining a low eco-footprint. The camp will be 100% solar powered and feature nine luxurious tents, each with a large bedroom and lounge leading to a veranda with a private plunge pool and thatched sala. The river that runs along the camp is home to serval species of birds and is a magnet for wildlife in the dry season. The spacious main area will include a lounge, dining and bar area set on expansive raised decks. There is also a pool and an open-air kgotla for dinners under the stars. We are excited to see the property once it’s finished! Noted as southern Africa’s premier elephant camp, Abu Camp (partly owned by Paul Allen, co-founder of Microsoft and rated 6-stars! ), has been completely rebuilt and refurbished. With only six individually decorated units (part tent, part cabin), this is an exclusive, unique safari locale. You may walk with the camp’s trained herd of elephants. This expansive 450,000-acre private concession is set with the pristine area of the Okavango Delta. Other features include a well-stocked library and study, gym, and swimming pool. Based on their goal of a holistic elephant experience, please note that Abu does not offer elephant rides. The focus will be on the immersive walking-based experience for which Abu is well-known. Located in eastern Okavango Delta in the Chitabe Private Concession Area (covering 28,000 hectares), Chitabe Camp offers eight luxury rustic-style, tented suites, built on elevated wooden decks among shrouded trees. Similar to other luxury safari camps, each Chitabe tent offers indoor/outdoor showers and a thatched roof dining/bar/lounge area on a raised deck, offering great views of wildlife across the floodplain. As a land-based camp vs. the “wet” camp of Vumbura, Chitabe’s wildlife drives include plenty of animals and is particularly noteworthy for its population of wild dogs (a rare viewing experience in most areas of Africa). Morning, afternoon, and sunset wildlife drives are provided, similar to Vumbura. Located on the aptly-named “Paradise Island”, surrounded by year-round water and lush vegetation, Xigera Camp is noteworthy among birdwatchers. The camp consists of 10 luxury, raised tents with outdoor showers in the heart of the Okavango Delta. Traditional night boma, mokoro (dug-out canoes), and motorboat excursions and wildlife drives are all part of the adventurous experience here. Similar to other luxury camps in the Okavango area, you should expect high-quality meals and personal attention! Xigera Camp donates a portion of each charge to the Motswe Wa Tsholofelo Orphan Daycare Centre in Maun and the camp is 100% solar-powered. Permanent waters dotted with palm-filled hardwood riverine forests, a multitude of clear water channels, and expansive floodplains make up the Xigera Concession. Your activities at Xigera Camp will typically include mokoro and motorboat outings. Wildlife drives are seasonal, dependent on water levels. Mammal sightings include the water-loving red lechwe, spotted-necked otter, elephant, and tsessebe, along with the elusive sitatunga. Predators include leopard and spotted hyaena. In terms of bird-watching, expect to see the Pel’s Fishing-Owl, African Skimmer, Greater Swamp Warbler, and Wattled Crane. Located in the Kasane Forest Reserve, Chobe Chilwero Camp allows for a superlative connection to nature through its game viewing and camp design. Set atop a hill over the Chobe River, Chobe Chilwero has stunning views of floodplains spanning the Botswanan, Namibian and Zambian borders. Each of its 15 large, airy suites are a blend of modern design and traditional African finishing, complete with rain showers and large terraces. Chobe Chilwero’s amenities include a full-service spa, split level swimming pool, newly finished gym, lounge, library, and shaded veranda which looks out onto the gardens (great bird watching!). Set on the edge of Chobe National Park, on game drives you may see elephants (largest population of elephants in Botswana here! ), lions, leopards, buffalos, cheetah, and wild dog hyena, making this camp a rare habitat due to its varied terrain. Aside from traditional game drives, activities here include a water safari to see eagles, long-neck herons and Nile crocodiles as well as sundowner cruises.